Founder and Director of the Unitarian Universalist Church in Cherry Hill's arboretum, Ken Arnold, 94, of Oaklyn, prunes a witch hazel shrub as he and other church members take part in a spring cleanup March 16. The spiky yellow blossoms on the witch hazel bush Ken Arnold planted a decade ago resembled little bursts of sunshine in the almost-spring morning light. 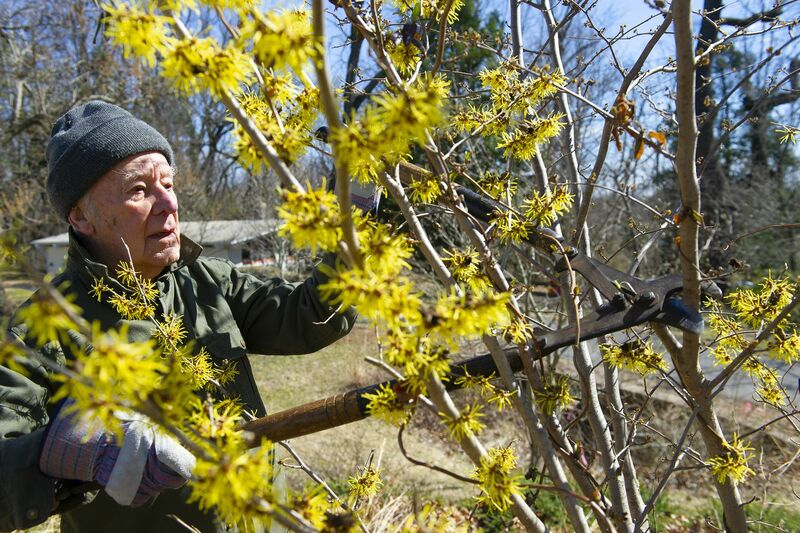 As he’s done for nearly a half-century, Arnold, 94, was pruning and otherwise tending to the arboretum at the Unitarian Universalist Church in Cherry Hill. About 40 volunteers from the church community and local garden clubs turned out Saturday to help the retired landscape architect, who lives in Oaklyn, spruce up the 17.7-acre grounds of the church on North Kings Highway. The church wants to draw more visitors to "this hidden gem,” said Les Engels, who heads the arboretum committee. “People don’t know this is here," he said. “It’s sort of been a secret. A good secret. But it’s not anymore. We want people to visit." Despite having attended weddings, 12-step meetings and other events at the church over the years, I had no idea the grounds are home to a curated collection of trees, shrubs and other plants, arranged to complement, enhance, and preserve this lovely expanse of open space on Cherry Hill’s west side. The grounds are free and open to the public from dawn to dusk. Unitarian Universalist Church members, near a row of scarlet oak trees, take part in a spring cleanup of the church's beloved arboretum in Cherry Hill. Once home to a hilltop farm, the property was bought by the church in 1961 and added to in later years. With Arnold’s help, the arboretum was formally launched in 1962. He’s the founder and director, a title that amuses him. “I’ve yet to meet anyone who joined a church to be a groundskeeper,” he said. “The arboretum is Ken,” said Engels. Although the grounds do have a wow factor — a steep but eminently walkable hill in the back of the property drops dramatically into a dense woodlands — the arboretum isn’t a South Jersey version of Longwood Gardens. Rather, it’s a handmade, low-key, but fascinating assortment of unusual as well as familiar trees and shrubs, a labor of love by a man who has worked methodically and incrementally in his spare time, over decades and on a limited budget. And the memorial benches and locations where the ashes of people who loved a particular spot have been interred attest to the power of the special place he has patiently stewarded. About 500 different species had been planted when the collection was essentially complete about five years ago. The arboretum grew organically, as ideas and opportunities arose. Arnold kept an “accession book,” or register, of every species he bought at local nurseries, or by mail order, and would very much like to have a new inventory taken. Many of the specimens don’t have tags, but he has kept records of what’s planted where. "We need to find out what plants are no longer alive, and see if we can get them back in the collection,” he said. We headed down the hill, and my guide proved to be as agile as he is knowledgeable, sharing vignettes about voracious deer, the spring water that bubbles up from the hillside, and the generous neighbor who donated five acres to the arboretum a few years back. The man knows every inch of the ground, as well as what’s growing from it. “Here I have some evergreen magnolia. Southern magnolia are evergreens. See how nice and shiny they are? They have big white flowers,” he said. The founder and director of the Unitarian Universalist Church in Cherry Hill's arboretum, Ken Arnold, 94, of Oaklyn, takes a look at a Chinese fir tree during the spring cleanup of the arboretum, sometimes called the “secret garden,” the congregation maintains on its North Kings Highway campus. “That’s a Chinese fir.” Arnold took hold of a brushy, palmlike frond to show, then pointed to a deciduous tree, Camelia stewartia (“I don’t know who Stewart was”). The exfoliating bark was an eye-popping array of soft, earthy hues. I’d never seen anything quite like it, or like what I saw on our next stop: The trunk of a magnificent Shagbark hickory tree, the namesake bark of which was seemed to have been intricately scored and razor-etched. So how does it feel to have created such a wonderful place, I ask. And sometimes, things happen for a reason.